Swimming pool fountains add a nice flair and a cool, refreshing, sound as you relax by the pool or entertain friends. Enjoy watching the pretty view and hearing the soothing sound of moving water with this pool decoration. There is a nice variety of fountains to choose from that are actually quite inexpensive. 2. Cools the temperature of your pool when it gets too warm. Or if the air temp is warmer than your pool water, the fountain can actually warm up your pool water. If you live in areas where the summers get really hot like Texas, Arizona, or Georgia, run your pool fountain at night when the temp is cooler and the temperature of the pool water will drop. 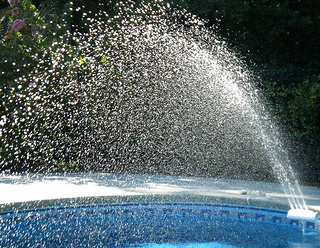 Be sure to get your pool fountain hooked up for your next pool party. It's the perfect pool party decoration for luau or beach themed pool parties. Most floating pool fountains attach to the return of the pool and work on any standard system. They come with an assortment of fittings needed to fit many types of pools. The height of the fountain can by adjusted by covering more or less of the bleed holes - these are holes that are on the elbow piece of the fountain. The more holes that are covered the higher the fountain will go. There are several styles of swimming pool fountains to consider. We purchased the 3 tiered Grecian pool fountain by Swimline. It can be used in an above ground or inground swimming pool. You may be surprised like I was that this fountain costs less than $40. Amazon has really good prices and you can get free delivery if you are a prime member. We got our fountain in just days. The long tube makes it possible to position the swimming pool fountain anywhere in your pool. Decide where you want it and then attach the weight to the tube so it stays put. We love using our floating pool fountain especially when we have guests and are entertaining out by the pool. It adds a nice sound and visual delight. This is the one that we have and use. This fountain attaches to the side of the pool. It doesn't get in the way of swimming if you want to play in the pool. It was easy to attach and inexpensive. The power of the spray can be adjusted. We love the look of a fountain and the refreshing splashing sound it makes. We can leave this one up since it sits right on the side of the pool. Install this easy swimming pool fountain for your guests to enjoy the soothing sound of splashing water and the cooling effects of fountain. We use our pool fountain to cool our water when it finally gets too warm in August, and also love to turn it on when we our out sitting by the pool. You can get one at Amazon for less than $20. Looking for some evening pool party lights? Get a LED lighted pool fountain that floats in the pool. There are a variety of styles and LED colors to choose from. No batteries are required and no need to worry about LED lights burning out as they last 1,000s of hours. They simply run off the water pressure. You can get a lighted pool fountain that changes colors or one that simply has a nice white light. This one has a water spray that is approximately 40" high, 30" diameter, and is adjustable. It is a great floating pool decoration for any night time gathering around the pool. Solar Power - Good Idea or Not? I really wanted a solar pool fountain. It would use the energy from the sun to keep our swimming pool fountain going during the day depending on how sunny it is outside. It would be easy to install since it wouldn't require any pump or other type of power. A solar pool fountain in theory is a great idea. Easy, and practical because there is no installation. Just place the floating fountain in the pool and let the sun power it ...right? Solar fountains can't be compared to swimming pool fountains that run off of the pool pump. The solar ones are just too weak and small for a pool and are best left to be used for those with a pond or a bird bath. First let's compare the height of the spray. A solar powered fountain can maybe reach a height of 2-3 feet. While one that is powered by the pool return can get up to 17 feet. 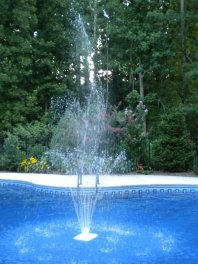 As pool owners, the pool pump needs to be run several hours a day anyway, so it is really not costing any more to have the floating pool fountain run from the return. If you think you'd like to have a fountain for a small backyard pond or bird bath than go ahead - use solar. Solar doesn't require any type of wiring or complicated installation. Place the solar fountain in a sunny spot in the bird bath or pond and the solar panel powers the pump. The most important aspect of running the fountain is to put the the solar plates where they will receive the most direct sunlight for the most hours. Swimming pool fountains offer the soothing sound of tumbling water and a cooling view of water spraying through the air. Not only does a fountain offer a visual delight, it can serve a purpose as well.